Ross Chamberlain scored a try for Borough against Northampton Old Scouts. Coach Phil Powell rang the changes in his starting line-up to allow some players to show how they could perform with an eye on the forthcoming East Midlands Cup Final. Joe Andresen was in fine form for Borough at Northampton Old Scouts. Borough started strongly and in the fifth minute Chris Sykes crashed over following a catch and drive from a lineout. Matt Newman added a difficult conversion. Within 10 minutes centre Tom McClure, making his first team debut, went on a 35-metre surging run to touch down under the posts. Newman added the conversion. Next to get on the score sheet was scrum half Ross Chamberlain who burrowed over from a five-metre scrum. The conversion was missed. A further try was added by Rob Moulds following a superb off-load from second row Josh Myles. Newman again added the extras, and Borough already had the bonus point they required. In the 37th minute fly half Joe Andresen who was impressively running the game, intercepted a loose Old Scouts pass and sprinted home from 40 metres. Newman added his fourth conversion to leave the half time score at 33-0 and Borough firmly in control. 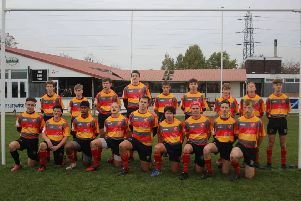 In the second half Borough made several changes and inevitably the game became very disjointed, with both sides making handling errors and the pattern of the game therefore deteriorated, allowing a spirited Old Scouts to score four tries. Borough’s only moment of joy came when Ryan Morris scored in the 72nd minute, following another strong run from McClure. With time running out Old Scouts scored their bonus point try, deserved by their ability to stage a second-half comeback. Borough now turn their attention to an East Midlands Cup Final against Bedford Ath, at Goldington Road on Tuesday 30th April (7.30pm). This gives coach Phil Powell the opportunity to pit his wits against a side playing a league a level above the City side. Having rotated his squad for yesterday’s game he will be looking to select his strongest options for what should be an exciting challenge.